Why is it that certain intervals, scales and tones sound genuine and others false? Is the modern person able to experience a qualitative difference in a tone's pitch? If so, what are the implications for modern concert pitch and how instruments of fixed tuning are tuned? Maria Renold tackles these and many other questions, providing a wealth of scientific data. Her pioneering work is the result of a lifetime's research into Western music's Classical Greek origins, as well as a search for new developments in modern times. She strives to deepen musical understanding through Rudolf Steiner's spiritual-scientific research, and she also elucidates many of Steiner's often puzzling statements about music. The results of her work include the following discoveries: that the octave has two sizes (a 'genuine' sounding octave is bigger than the 'perfect' octave); that there are three sizes of 'perfect' fifths; that an underlying 'form principle' for all scales can be found; and, most importantly, the discovery of a method of tuning the piano which is more satisfactory than equal temperament. She also gives foundation to some of Rudolf Steiner's statements such as: 'c is always prime' and 'c = 128 Hz = Sun'. MARIA RENOLD (1917-2003) spent her childhood in the United States, where her parents emigrated to found a eurythmy school in New York. She studied eurythmy and later violin and viola and toured with the Bush Chamber Orchestra and the Bush String Quartet. 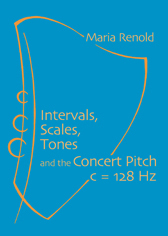 One of Maria Renold's deeply-felt questions concerned the correct concert pitch. When she heard of Rudolf Steiner's concert pitch suggestion of c = 128 Hz she put it into practice immediately, and experimented with it over many years in America and Europe. She also discovered a new method of tuning the piano, closer to the tuning of stringed instruments, arriving at the concert pitch of a1 = 432 Hz. First published in German in 1985, her book has become a modern classic of musical research.